The Backup and Restore tab offers the 4 features needed to successfully load a new operating system. BBSAK is one of the only apps currently available that allows you to create a backup of every 3rd party app on your device. 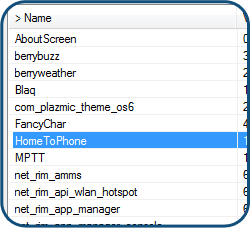 In the newest version, this function will even backup 3rd party apps created by RIM, such as Twitter or Facebook. 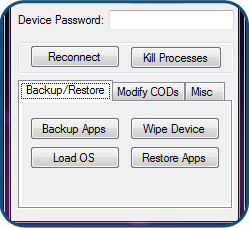 To use this function simply click "Backup Apps," enter a name for your backup and let BBSAK do the rest! Wipe Device, is a tool used to completely remove everything on your device including the operating system, leaving your phone at a 507 error screen. This function can be used to restore a "bricked" blackberry. Please make sure to backup everything you need before running this feature! Load OS (Operating System) is a tool that allows you to install an operating system to your device. 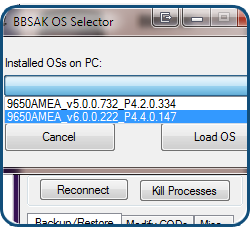 New to BBSAK 1.8.5 we have given then users the ability to select which OS you want! This even includes downgrading your OS without uninstalling newer OS's from your computer! 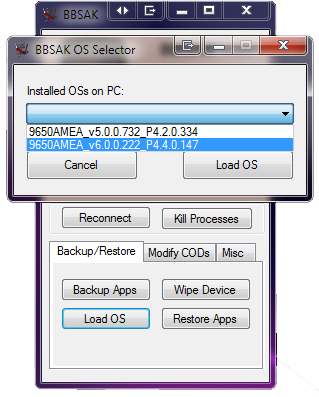 Furthermore, to avoid confusion the OS Selector will only show you installed OS's for the device currently connected to BBSAK. This function uses the App Loader Wizard provided to us by RIM. 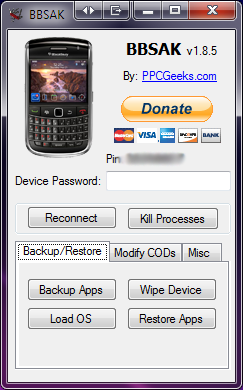 The Restore Apps function allows the user to select the backup JAD that was created by the Backup Apps function in BBSAK. 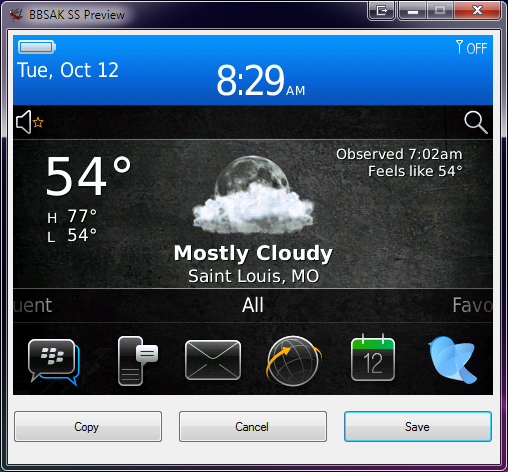 Once the JAD is selected BBSAK will install all the apps included in your backup, back on to your blackberry. Please note your phone will reboot after this function is complete. 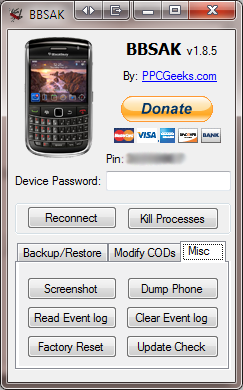 The Modify CODs tab includes functions designed for the more advanced Blackberry users. 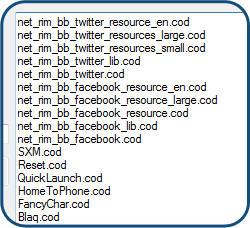 This tab will allow you to do a variety of thing revolving around individual CODs on your blackberry. The read system fucntion will read every COD installed on your device and print them into a nice list displaying, name, size and version number. 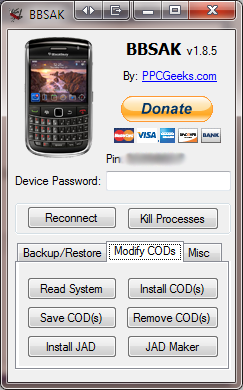 Load COD(s) allows you to install single or multiple cods from your computer to your blackberry. 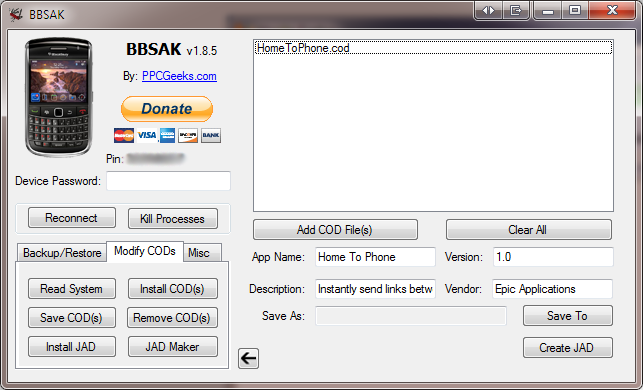 TO use this feature, click the Install COD(s) button choose the directoy where your COD(s) are and let BBSAK do the rest. Please note your phone may reboot after this function completes. Also note that apps installed using this function will not show up in the settings/applications menu. 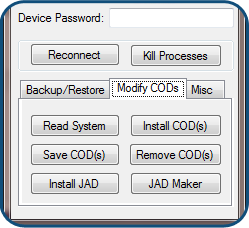 Save COD(s) allows you to save single or multiple cods from your device to your computer. These files will be located in the BBSAK/CODS folder. To use this function first run Read System then highlight one or more of the CODs in the list, finally click Save COD(s). 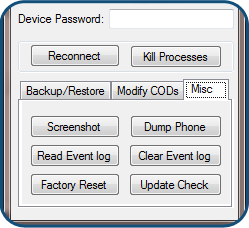 Remove COD(s) allows you to delete single or multiple cods from your device. To use this function first run Read System then highlight one or more of the CODs in the list, finally click Remove COD(s). Please note, deleting COD's cannot be undone. When this function is complete your phone may reboot. Load JAD allows you to install a JAD file from your computer to your Blackberry. Please make sure the folder where your JAD is located also contains all of the CODs that the JAD refers too. Please note phone may reboot after this operation is complete. 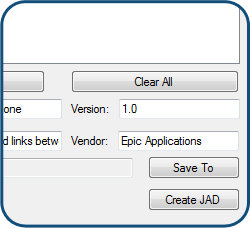 The Make JAD feature, allows you to create a JAD file for a list of COD(s). To use this function, drag and drop files into the box or use the file browser, make sure all information is filled out and that version number starts with a integer. Finally select your save location and name, and click "Create JAD." This tab contains everything that didnt fit into another tab. This function does exactly what it says, it takes image of your blackberry's screen. It shows a preview and allows you to Save or Copy. Dump phone is a function that is designed for hybrid building. It will save every COD on your device to your computer. This dump will be located in "BBSAK/Dump." 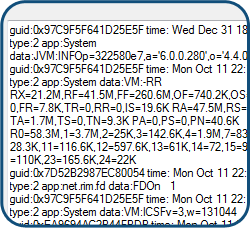 The Event Log is a great tool for app developers. This function allows you to save your eventlog to a text file on your computer for later debugging. The Clear button will clear your devices event. The Factory Reset function is used by those who have an IT Policy put on there Blackberry via a BES Server. This function will remove the IT Policy from your device. 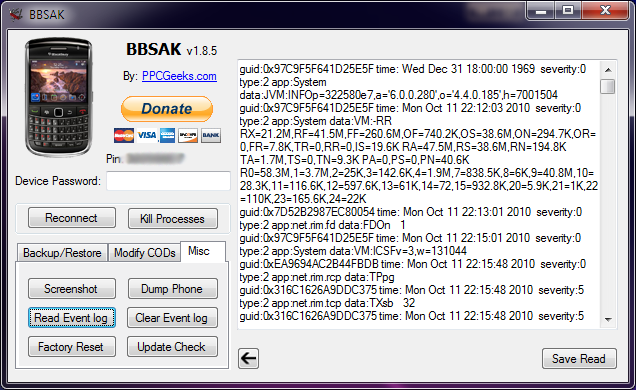 BBSAK is a community effort provided for free by two hobbyist developers. If you found this app useful, please consider supporting future development by donating a small amount ($5 recommended) through the PayPal . Thank you for your support! 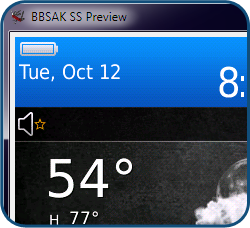 We also send users who donate $5 or more the "No Nag Screen" version of BBSAK. Copyright © 2010 JMTLabs All Rights Reserved.